Website accessibility testing: tools that can help you meet the needs of your users. Most nonprofits and businesses recognize the value in spending time and money on modern websites. They know their site needs a positive user experience and an ability to convert visitors into engaged community members. But one area that often seems to be an afterthought is accessibility. 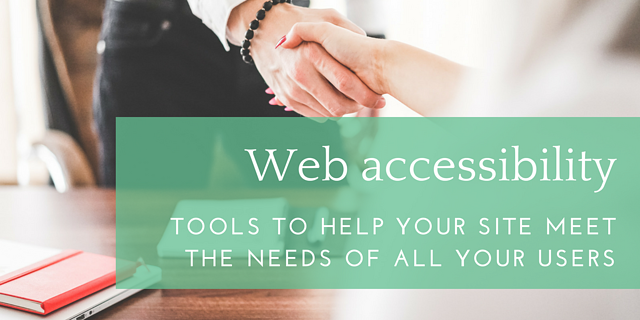 Below we’ll review some of the most popular accessibility scanners and help you determine the best approach for your website. Under the law, any organization that does business with the public must be accessible to those with disabilities. However, that law is only gradually extending to include the websites those same customers use to get information. Since 2006, customers have been taking legal action against companies they claim don’t make their online information accessible to those with disabilities. In addition to legal repercussions, companies and nonprofits also stand to lose business if they don’t make it easy for visitors with disabilities to get the information they need. For example, a visually-impaired visitor may be searching for a law firm, and choose one firm over another solely because of their more accessibly website. The firm chosen took a small extra step to add equivalent alternative text to each image on its website so that screen readers could interpret it. Even as an agency, assessing and implementing an accessible site can be difficult. This is why we are hosting a Web Accessibility panel on March 22nd at our office. Learn more and register here! Learn as much as possible about accessibility design and audit your own website. This is a cost-effective option, but it also takes a substantial chunk of time. Hire an expert. This is the most expensive option, especially if you already have a website in place. However, it might be worth the expense if this can bring in more business – not to mention, help you avoid a lawsuit. Use a tool (see below!). Accessibility scanners can search your current site and offer feedback on areas where accessibility might be an issue. These tools are usually free and can operate as a great jumping-off point for auditing your site. Keep in mind, no scanner will take the place of a real person. Tip – If you’re considering a website redesign, include accessibility design in your list of search criteria. Like many tech-based solutions, accessibility scanners aren’t perfect. However, if you aren’t sure where to start, it can be a great way to get an idea of the issues that might exist on your site. Here are a few of the most popular accessibility scanners. AChecker: This checker lets you enter a website’s URL or upload HTML files for accessibility feedback. You’ll be delivered a list of known problems as well as likely or potential issues. It even delivers some suggestions for repairs. Wave: WAVE details issues via errors and alerts. It highlights issues with features, structural elements, and HTML5 and ARIA. Switch to the “No Styles” view and you’ll see the HTML version of your page, complete with markups for any accessibility issues. Accessible Email: You don’t want to neglect your email messages, as they are a large part of your marketing efforts. This is not only the way you communicate with your existing audience, but it’s often the way you reach out to new customers. This tool lets you insert HTML from an upcoming email or link to an existing campaign to learn how you can make your messages more accessible. Accessibility Scanner: Don’t forget to check your apps. This scanner reviews Android apps for accessibility and suggests changes that can be made even if you don’t have technical skills. It isn’t enough to evaluate accessibility. This fits into a larger context of delivering what your audiences needs. Savvy nonprofits and businesses consider the usability of everything they do. You should constantly approach your website, apps, products and services from the customer’s perspective. When visitors have a bad experience, they’re less likely to become engaged audience members and more likely to check out your competitors. It’s critical that your website is designed for all people, no matter their situation, to get the information they need.